The three pairs of legs are alternately called 1) the front legs, middle legs, and hind legs or 2) the forelegs, midlegs, and hindlegs, or 3) the prothroacic legs, mesothoracic legs, and metathoracic legs. In turn, the various segments of each leg can also be distinguished. The tibia, for example, might be called the front tibia, prothoracic tibia, or protibia; middle tibia, mesothoracic tibia, or mesotibia; and hind tibia, metathoracic tibia, or metatibia. Each leg is composed of six segments, the coxa, trochanter, femur, tibia, tarsus 1, and tarsus 2. 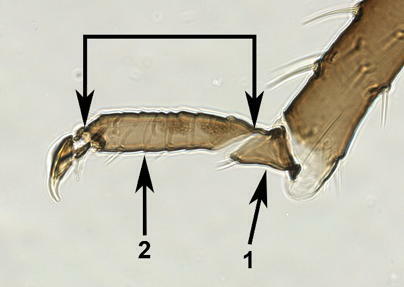 The six segments are labeled on this hind leg. In some rare cases, the trochanter and femur are fused, making for five segments in all. In this case, the length measurement of the "femur" would be for both sections together. 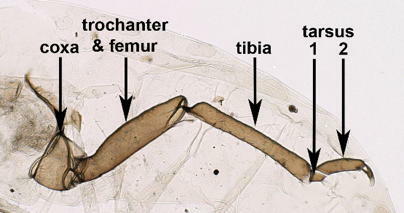 Note the slight constriction between the trochanter and femur. In some cases there is a faint vestigial line that demarcates the two segments. In these cases, the length measurement for the femur would be from that line to the distal tip of the segment. The femur is the third leg segment, and the second longest. Image showing the length of the femur. Note that there is a dorsal and ventral aspect to the femur. Femoral seta lengths are measured for dorsal setae. The tibia is the fourth leg segment and the longest segment. When measuring the length of the leg, be sure to include the muscle attachment tubercle which is at the far basal end, above the "knee". Measure the diameter of the tibia near the mid-point of its length. 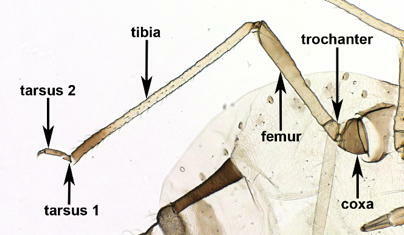 Note that there are dorsal and ventral aspects to the tibia. When measuring the length of a tibial seta, measure a dorsal seta somewhere in the middle half of the tibia. Based on muscle attachments, the tarsus is composed of two true segments: the two tarsomeres together as one and the tarsal claw. In common practice, however, the two tarsomeres are treated as two segments and the tarsal claw referred to as such. The first tarsal segment, also called the basitarsis, or tarsus 1, is usually very short. The second tarsal segment, or distitarsus, or tarsus 2, is longer. When measuring the length of the tarsus 2, there is no need to try to find the exact tip of the muscle attachment tubercle at its basal end.